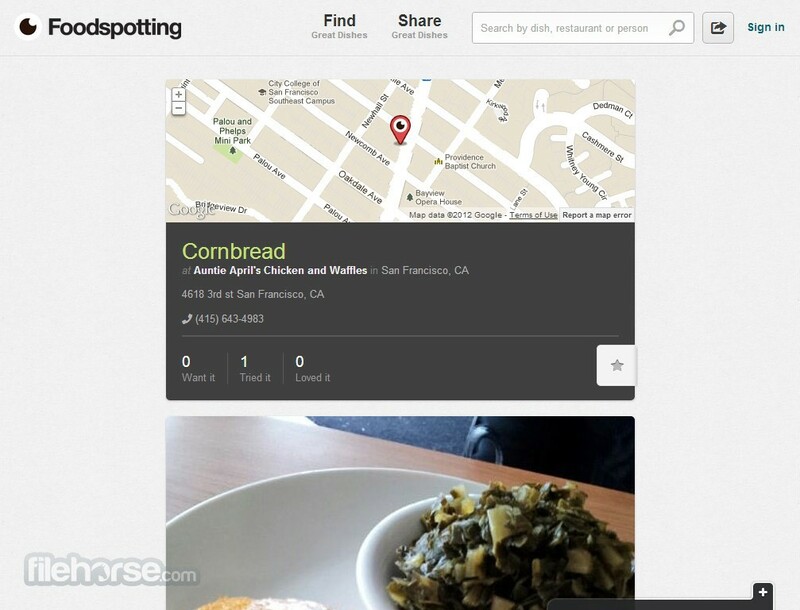 Foodspotting is an innovative social network that is built around the restaurants and foods. No matter where you are, or what modern computing device you are using, you can always find the closest place that is producing fantastic food and great services. Originaly created from the team of talented developers based in San Francisco, this could-powered website strived to provide its visitors the best place to discover new foods and share their experiences. The defining characteristic of Foodspotting is its crowd-sourced data, which does not consist of recipes, but of short and precise user reviews and pictures of meals you can find around you. By focusing on visual information that are collected by users themselves and useful reviews, everyone can instantly find their favorite food in a new city or discover new cuisines and restraints no matter where you are. Find and share great dishes! Foodspotting is a free service that can be experienced inside your web browser, modern mobile phones, tablet devices and it has deep connections with all your favorite social networks such as Facebook, Twitter, Flickr and FourSquare. This way, whenever you discover new favorite food, you can share with your friends instantly. Give it a try! Food is something that we all like, but discovering new and interesting food is even more fun and engaging. Discovering that special new food that brought you instant joy is a feeling that we all can appreciate, but how do we manage to find such special moments in more regular basis? Solution to that problem is an innovative cloud-powered community site Foodspotting that managed to distinguish itself from countless other food-related sites by focusing on incredible service of recommending not only popular restaurants around you, but detailed info about new and interesting food that you can taste there. With the help of the large community which shares their experience about food they have encountered during their restaurant meals, everyone can take advantage from their impressions and find (or be recommended) a meal that will surely fill their stomach with joy. The basic principle on which Foodspoting works is intelligent collection of data that users are uploading on daily basis, covering new dishes and restaurants that can be found in your environment. Users can easily mark where they encountered some meal, post a photograph of it and their detailed impressions. Those meals can be placed in specific categories to enable easier searching, and to make discovering more easily, each user can create their own lists of favorite meals, guides of best restaurants, and more. To make the recommendation even more viable and compatible with your tastes, you can elect to start following food recommendation either from your own Twitter friends, or start following someone for whom you know that has similar taste like you. 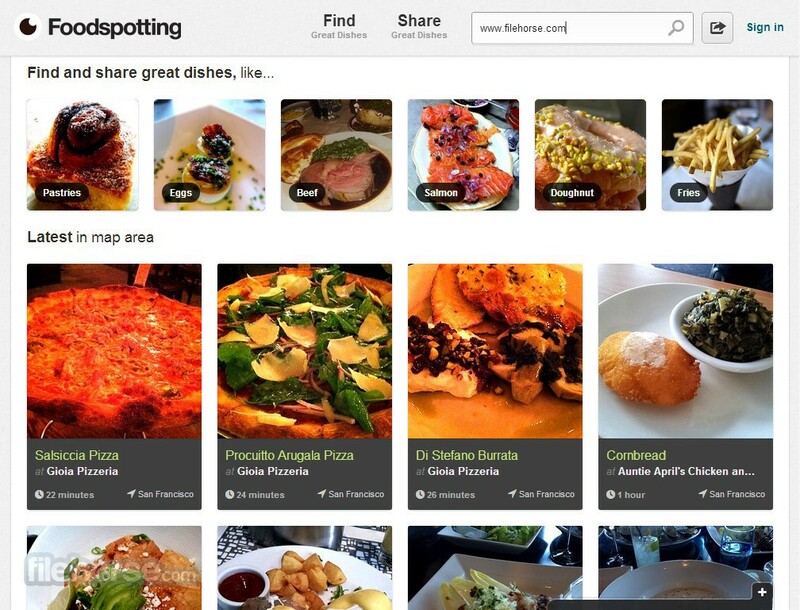 If you have found yourself in a new city and you want to taste best food that it can give you, Foodspoting intuitive map interface will surely help you to test the best of the best, and if you have time for a little adventure, you can even follow popular restaurant guides that users have submitted themselves. 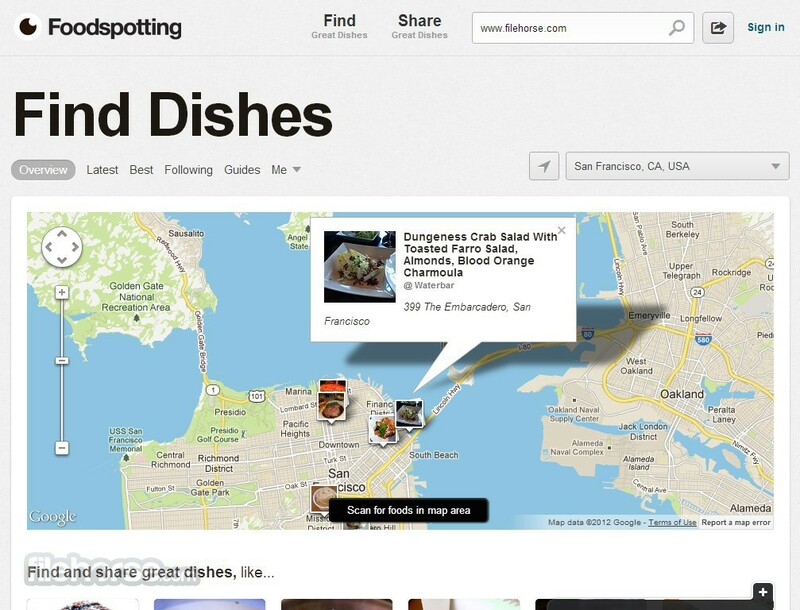 From the first moment you land on Foodspotting.com you will be welcomed with the brightly-themed interface that is dominated with the large map of your area. This Google map will instantly start to show you most popular meals around you, with specific attention being placed on meals from the people you have elected to follow. Below map you can find section for discovering great dishes of specific types (Pastries, Sadad, Chocholate, etc. 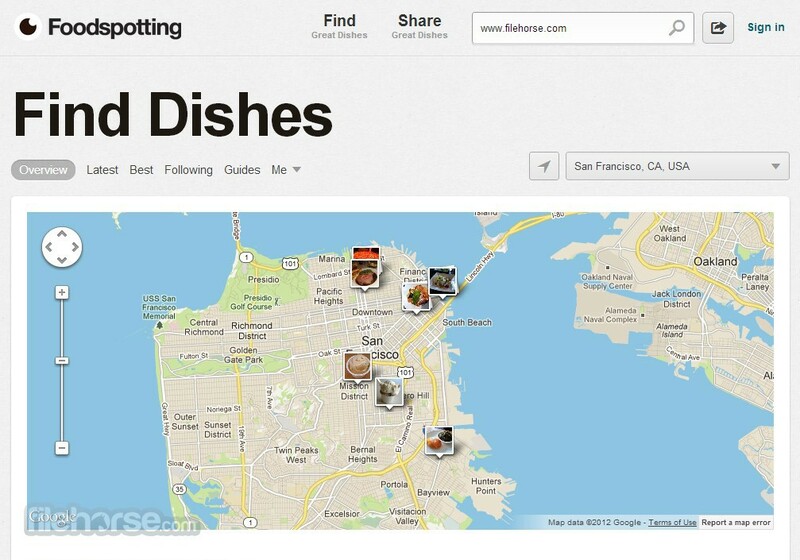 ), thumbnails of latest meals in your map area, and section for best meals in your area. Above the map, you can chose filtering option for your map (Overview, Latest, Best, Following, Guides) , including your own bookmarks for meal that you have either eaten, bookmarked for later meal, or meals that you have positively loved. As for individual pages of meals, they feature large image of the meal, brief description, information about restaurant (with address and other contact info), and community options for chat, bookmarking, rating and sharing. Find and share great dishes! Foodspotting does not require registration fee because if that was the case, site would discourage large amount of contributions that are uploaded to its cloud serves each day. Registration can be performed for everyone who is an admirer of great meals either by manually entering email credentials or by connecting your Facebook account to Foodspotting. The site itself does not have subscription, there are not in-site purchases of additional features, every user has a same level of access to its features, and once-created account will remain active forever. Because Foodspotting is not focused on providing recipes for its featured meals, it manages to target different type of visitors than other similar sites. Simply access the Foodspoting website (or dedicated app for mobile devices), and you will be immediately greeted with great food around you, and the ability to easily upload your own newly discover meals that briefly managed to transform you to culinary heaven.